This past April marked the 50th anniversary of the death of Rachel Carson. And while I certainly bemoan her absence and miss her iconic Silent Spring voice, I mourn more for the fact that her life’s work and sacrifice on our behalf has apparently taught many of us little or nothing. Exhibit “A” in this thesis is the list of herbicides contained in a 2012 private forestry spraying application for a 3,416 acre unit near the Willapa Headwaters in southwestern Washington (thank you, Jon Gosch). Rachel’s story is a powerful one and too often repeated. Here’s how it goes: A systems thinker (in her case a marine biologist) noticing trends and problems in the natural world compiles evidence that establishes correlative links between a chemical or chemicals and a natural or human health issue and then brings it to the public’s attention. These are not “proofs” in the traditional scientific sense but rather concrete rationales for further investigation—in short these are the building blocks of testable hypotheses. But once these building blocks form and become known, a storm of industry-led criticism always follows. We know the pattern: Credentials and motivations are questioned; industry scientists rush in to defend the safety of products; new brochures addressing criticisms are prepared; and those offering the hypotheses are quickly and roughly kicked to curb for being un-American, job-killers, communists or worse. In all of this we have to really wonder where the sin lies in raising legitimate and justifiable concerns. And when exactly did poisoning our wildlife and future generations become an American value? Now I cannot say conclusively, for instance, that forestry herbicide use on private lands is directly causing hoof rot in elk in southwestern Washington. That said, I know that the chemical cocktails being sprayed have some impact because herbicides directly lower available food supplies and that stresses elk (and deer) making them generally more vulnerable to any infections. And I have good reasons to suspect additional impact from glyphosate herbicides like RoundUp or Rodeo because they often control the availability of trace metals and micronutrients to plants, soil microbes, and thus bigger critters through a complicated process known as chelation that undoubtedly alters metabolic functions and other systems at each step up the food chain (see 1, 2, 3) And then there are some concerns about the immunological and thyroidal impacts of some herbicides. So this is not so much a debate about whether or not herbicides are contributing to this current elk affliction, but how far this class of chemicals moves the needle from zero (no impact) to 100 (proximate cause). I suspect that many in America believe that the establishment of the US Environmental Protection Agency and the passing of the Clean Water Act have worked together to reduce herbicide use since the 1960s when things were really “bad.” These are after all the pollution cop agency and a bedrock piece of environmental legislation. The reality is that while many chemicals were eliminated from use, many more emerged with a lot of them being herbicides. At the same time lots of wildlife issues such as difficult-to-identify diseases, deformities and population drops are manifesting themselves with similar things happening in human communities too. 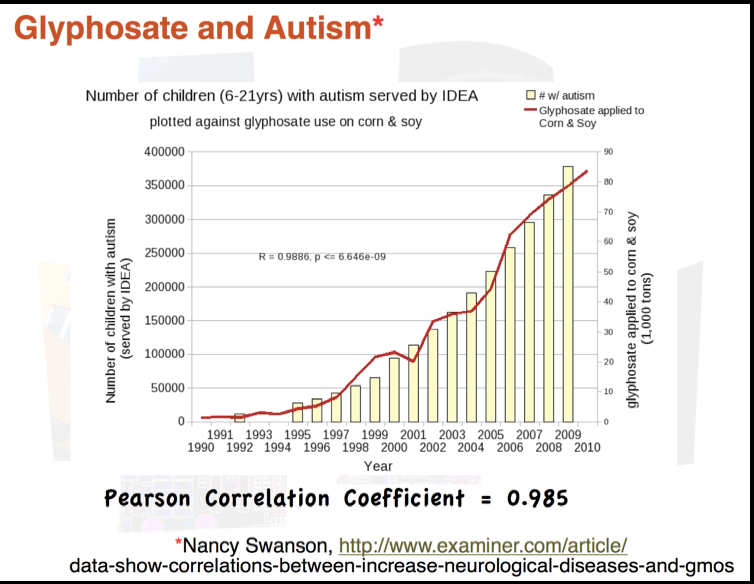 Certainly there are multiple factors involved in any wildlife or human health syndrome but the incidence of these problems and the rise of herbicide use seems to track well enough that serious questions should be asked (see glyphosate use and autism graph at right). 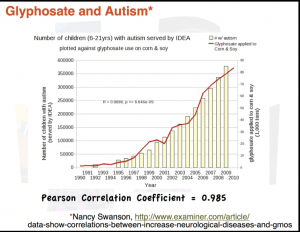 Now herbicide proponents will be quick to point out that these are only correlations and not causation. True enough, but like Rachel Carson’s work these correlations are and should be the vibrant roots of hypotheses that we must pose and follow to their conclusions. And before the charges of scare tactics are deployed and my ethics questioned, my sense is that it is much more responsible to ask legitimate questions arising from a well-constructed correlation, even if it might elicit fear and caution, than to agressively deny that fear and condemn that caution in the absence of adequate and conclusive testing. And if there is one thing that you learn from plowing through mountains of primary literature on herbicides it is that there is much we do not know and the number of studies that end with a desperate call for more studies is astounding. It should also be clear to those in the pro-herbicide camp by now that curiosity met with swift denial only leads to suspicion. And ultimately this becomes distrust if legitimate concerns are ignored or dismissed without visible investigation. They should also understand that suspicion and distrust can easily snowball into campaigns. This brings us to our present state which is not quite a broad campaign but more like isolated prairie fires across the rural western landscape that are starting to send sparks back and forth to each other. These efforts include those by non-traditional folks like hunters and citizen activists Jon Gosch (1,2,3) and Bruce Barnes working on the elk hoof rot issue in Washington; wildlife rehabber Judy Hoy in the intermountain West trying to figure out deformities in deer, elk and antelopes; and Josh Leavitt’s emerging efforts in Utah to serve as a research destination and clearinghouse. They also include the fine work of groups like our soon-to-be-ex-across-the-hall-neighbors, the Northwest Coalition for Alternatives to Pesticides or NCAP that fight this battle daily. (You see, Kim, I was listening and we will miss your shining faces and having Edward's organic eggs just a few steps away). 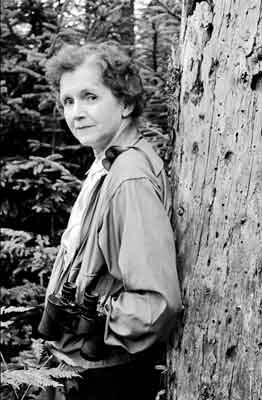 They should give us all hope that the brave spirit of Rachel Carson lives. But there is a second part of the Carson lesson and that is the grassroots part of the equation. For the US EPA to not think it is alright to characterize RoundUp similarly to table salt and for state agencies in charge of our forests, waterways, wildlife and health not to cavalierly sign off on the chemical carpet bombing enumerated at the top of this piece, we all have to speak up. Carson’s efforts were initially successful because you, your parents or grandparents spoke up in the 1960s and, therefore, for these current efforts to be successful you, your children and your grandchildren have to be vigilant and not think that the first Earth Day was the end of the battle but rather the beginning. Let’s get to it. The below action is one to get started, but more will follow from us or other "prairie fires" in the West. I hate the systemic proliferation of chemicals and I hate incomplete or disuasive science. Western Washington elk herds, like their prairie counterparts before them, have been driven from their usual haunts. In the case of the Washington herds, this is from mountain clear cuts to swampy low lands. I raised cattle in that environment nearly 50 years before this with (sometimes) the same result. But why not look at the near 75 year buildup of carcinogenic cocktails by the pulp and paper industry there, why is/has no one dealt with this?